Some millennials are slow to fully leave the nest, but there’s at least one instance in which that can work in their parents’ favor: the family cell phone plan. Heather Morgan doesn’t think her daughter, Vicki, 30, will ever leave the family cell phone plan — but she’s OK with that. “It’s such a good plan, and it’s very price effective,” says the 64-year-old accountant from San Mateo, California. Just look at the monthly cost difference between a family plan and a solo plan from each of the four major wireless providers. Each carrier’s data packages differ, so we analyzed plans that provide around 2 gigabytes per person, per month. The costs include charges for the data package, line fees and device installment plan (assuming an iPhone 6S 16GB on each line, financed over 24 months). Taxes, fees and add-ons, such as insurance, aren’t reflected in these costs. Keeping that money in their bank accounts can help some young adults get on their feet after college. That was the case with Brandon Schroth, 27, a digital analyst in San Diego who recently got his own cell phone plan after more than a decade on his parents’. His 31-year-old brother was also on their plan. Morgan, her husband and her daughter divide the family’s roughly $200 monthly bill in thirds. Her daughter pays her share each month. “She’s independent; she doesn’t live with us or anything,” Morgan says of her daughter, who works in sales. Schroth says that part of the reason his parents let him stay on their plan was that he paid his portion of the bill each month and never went over their plan allowance. Sometimes parents have to nudge their kids off the family plan, though. That’s what happened to Schroth and his brother, after his brother racked up hundreds of dollars in data overages. Parents and their adult kids can save hundreds of dollars each year by joining forces on a family plan — but there are ways to save even more. Check your usage: Figure out how much data you’ve used during the past three months by checking your bill or your carrier’s app. Once you know how much data you really need, you might be able to save money by switching to a plan with lower monthly data limits. Find data-saving features: If you use the bulk of your data for streaming music or video, consider a carrier like T-Mobile, which offers plans with unlimited streaming from sites such as Netflix, Hulu, Spotify and Google Music. Connect to Wi-Fi when possible. Download playlists to listen to offline. Switch to a lower streaming quality on music and video apps. Turn off autoplay for videos on Facebook and other apps. Go prepaid: Boost Mobile, Cricket Wireless and MetroPCS all offer family plans for a fraction of the cost of traditional plans. For example, Boost Mobile offers four lines with 2GB per line, per month, plus unlimited talk and text, for $100. That’s just $25 per line. Cricket offers 2.5GB per line for the same price. Just keep in mind that prepaid carriers often require you to pay full price for your phone, rather than spreading the cost out over two years. Some carriers let you bring your own phone, if it’s compatible. You can also save money by buying a used cell phone. 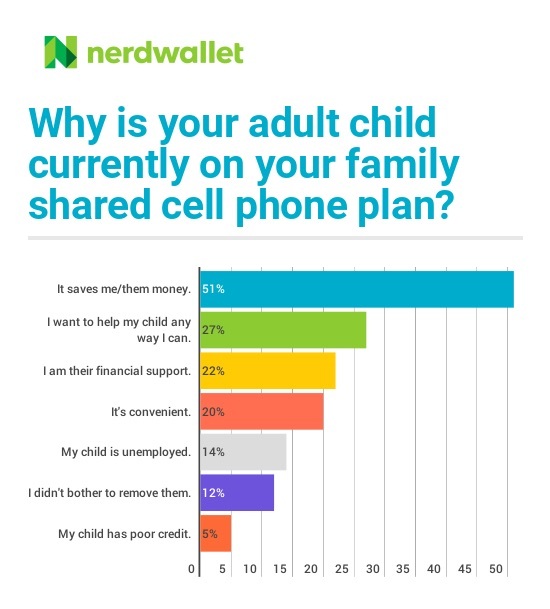 This survey was conducted online within the United States by Harris Poll on behalf of NerdWallet May 19-23, 2016, among 3,010 U.S. adults 18 and older, among whom 1,619 are parents of children ages 18+ and own a smartphone/mobile phone, and of those 730 have or previously had an adult child on their family shared cell phone plan. This online survey was not based on a probability sample, and therefore no estimate of theoretical sampling error can be calculated. For complete survey methodology, including weighting variables, please contact Maitri Jani.